A structural formula is a chemical formula which shows the arrangement of the atoms in a molecule of a substance. All atoms are bonded together by covalent bond represented by a straight line. The bond can be a single bond, a double bond or a triple bond. Step 1: Determine the number of carbon in the molecule (Let’s say 3 carbon atom) Step 2: Draw all the carbon atoms in a straight line and then draw the covalent bonds to connect all the carbon atoms. Step 5: Check that each carbon atom has four single covalent bonds, each hydrogen atom has one single covalent bond. 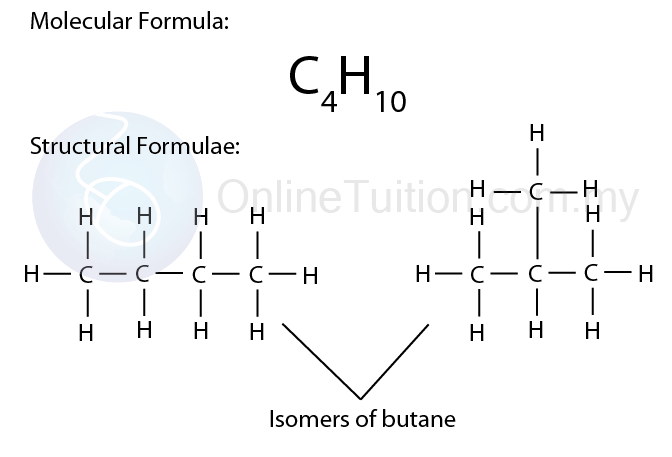 Isomers are compounds with the same molecular formula but different structural formulae. Isomerism is the existence of two or more compounds that have the same molecular formula but different structural formulae. Isomers have different physical properties because they have different molecular structures. However, isomers have the same chemical properties because they belong to the same homologous series.